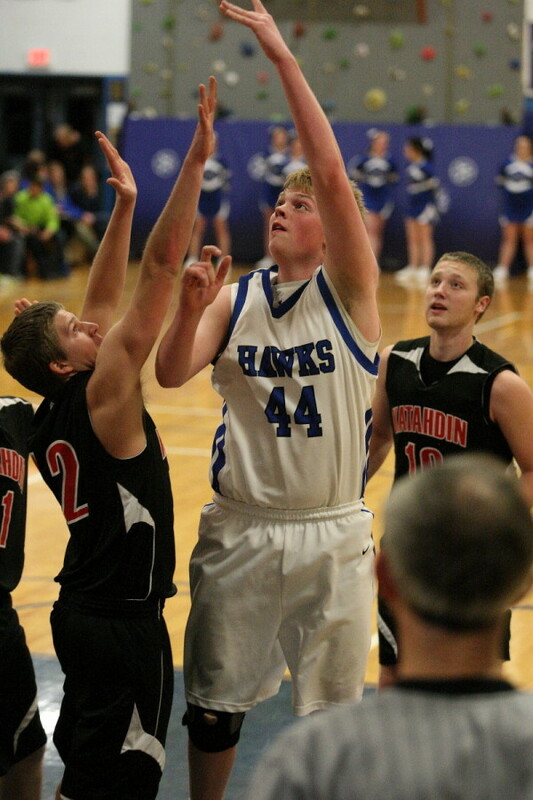 Hodgdon's Kevin McAfee lofts a shot in this file photo from the 2014-15 basketball season. McAfee missed his entire junior season with a knee injury sustained in an exhibition game. Katie Condon takes the ball to the hoop during a Dec. 9, 2015, game against Presque Isle. Condon injured her knee 10 days after this game and was lost for the season. HOULTON, Maine — Suffering a season-ending injury is something no student athlete wants to endure. And yet, each year there seems to be a couple of local high school athletes who must overcome such an injury. P.J. Madore, a physical therapist at County Physical Therapy in Houlton, said his office has seen a steady increase in the number of high school athletes diagnosed with knee injuries, as compared with 10 or 15 years ago. Twenty to 30 years ago, hearing that a high school athlete went down with a noncontact knee injury was rare, but it is becoming more commonplace, according to Madore. A study issued at the 2015 American Academy of Pediatrics in Washington revealed that the occurrence of anterior cruciate ligament, or ACL, tears for patients ages 6 to 18 has increased by 2.3 percent per year in the last 20 years, cbsnews.com reported. Madore said one of the reasons knee injuries are becoming more common is because many youths start playing sports at an earlier age and play competitively year-round. Studies have shown that female high school and college athletes are more likely to sustain knee injuries than males, according to a usnews.com report. Several athletes in Greater Houlton recently suffered knee injuries. In the 2014-2015 school year, Houlton High School’s Hannah Foley and Hodgdon High’s Keegan Gardiner suffered season-ending knee injuries. So far this year, two high-schoolers, Houlton senior Katie Condon and Hodgdon junior Kevin McAfee, had their basketball seasons cut short by knee injuries. Condon, a senior at Houlton High School, injured her knee Dec. 19 in a game against Mount Desert Island in Bar Harbor. It was the fifth game of the season and brought an end to a stellar high school basketball career. Condon said she felt a distinct pop in her knee and for about a half-second she didn’t feel any pain, so she thought she might be OK.
Condon was able to walk off the court under her own power and was able to walk somewhat normally with the help of a large knee brace before undergoing surgery. Condon said she was told by doctors she could choose not to have the surgery and could lead a somewhat normal life. Sports, however, would only be possible if she had the surgical procedure to repair her ACL. Condon’s mother is a physical therapist and was familiar with these types of injuries, so the family opted to wait about a week before seeking a doctor’s opinion. Her MRI revealed a complete ACL tear, with a couple of bone bruises. She underwent surgery Jan. 19 in Portland. Condon said her recovery is expected to take six or seven months, but the mental aspect of feeling confident in using her legs in a sports setting may take a bit longer. She goes to physical therapy three times a week and has made great strides. She has spoken at great lengths to Foley, a soccer teammate, about her recovery from knee surgery. Foley told her that one year removed from her injury she hardly thinks about it anymore. “That was exactly what I needed to hear,” Condon said. Condon is looking at the University of Maine at Fort Kent, Husson College or Central Maine Community College to pursue a degree in nursing. She has yet to decide which school she will attend. She hopes to play at least basketball in college, with the possibility of soccer as well. For McAfee, a Hodgdon junior, his basketball season ended before it even began. The son of Hollie and Tim McAfee of Hodgdon, he was injured Nov. 20 during warmups of the first preseason game of the year. McAfee has endured knee issues throughout his high school career. McAfee suffered a partial tear in his right meniscus during his sophomore year, while attending a youth event. That injury did not require surgery to repair. The injury to his left leg, although painful, was nowhere near as difficult as the mental pain of having to sit on the Hodgdon bench this past season. McAfee stayed busy by keeping statistics for coach Rob Smith. He also used comedy as a way to get through the difficult times. He walked with a cane for a couple of days as he was able to bear some weight on the legs. Using the cane drew some comical reactions from his classmates. McAfee underwent surgery Jan. 6 in Bangor to repair a torn meniscus in his left knee. The surgery lasted about 45 minutes and involved reattaching portions of his meniscus and removing other parts. “I am hoping I will be better than ever for basketball next year,” he said. McAfee was cleared to begin light running and jumping in late March and on April 2, he left with members of the Houlton Wesleyan Church for a weeklong missions trip to Haiti. It marks the second straight year McAfee has participated in this missionary adventure, doing construction work at a local hospital. According to Madore, the ACL is one of four ligaments in the knee that connect the upper and lower leg bones. The only way to know for sure if a ligament has been torn is for the athlete to undergo an MRI. The rehab timeline varies on a case-by-case basis. Some athletes rebound quickly and can be back in action in about six months, while others may need eight to 10 months to even a year before they are able to return to competitive sports. The severity of the knee injury, whether it is a single ligament tear such as an ACL or a multiligament tear involving the PCL and meniscus, also plays a role in how soon an athlete gets back to action. Overcoming the mental aspect is another big hurdle for those recovering from knee surgery. For most athletes, it takes a true year, if not longer, to fully regain confidence in their abilities to return to competitive sports, he added. “Sometimes they come back even stronger because they are more aware of their bodies,” he said. Correction: An earlier version of this story incorrectly identified physical therapist P.J. Madore’s name.